Thinking of installing a new in-ground pool or doing some pool remodeling? Consider the beauty that can be added to your backyard paradise by investing in a new pool deck to surround your pool. This article will give you a detailed rundown of the benefits and advantages of using paving stones for your next pool deck as well as some tips you’ll need to consider when designing and installing your next hardscape creation. One great use for concrete pavers, as has been mentioned on other parts of this site, is installing them around a pool (a.k.a. a pool deck). 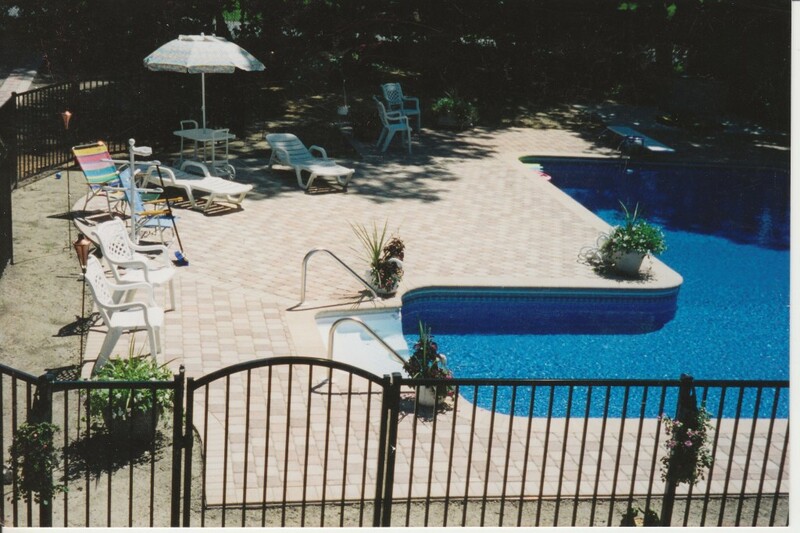 Pool pavers are a great choice for any inground pool or above ground pool because of their great flexibility and customizability: you can pick from many different colors, shapes, sizes, and paver designs of pool pavers in order to complement your patio and backyard theme or design. Concrete pavers are a great choice over the major alternative – poured concrete – because it does not crack over time. These cracks are both unsightly and a safety hazard. Installing concrete pavers around a pool can be expensive, depending on the project. However, they represent a great investment over the long term, as their durability makes them last a long time compared to other methods. In addition, they beautify your entire backyard and pool area, increasing the appraised value of your home. 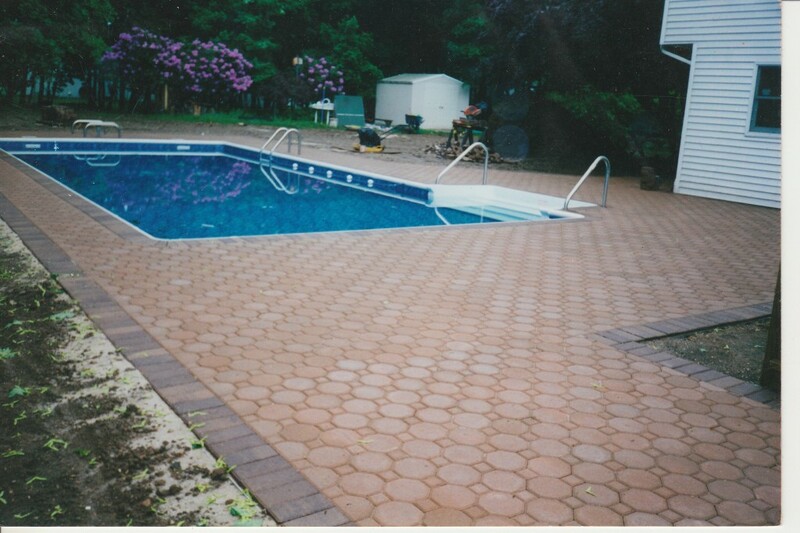 One thing to keep in mind with pool deck pavers is that their proximity to the pool can cause problems. Specifically, if care is not taken joint sand can fall into the pool, damaging or degrading the filter and other pool accessories. To prevent this, have your pavers treated with a stabilizing sealer. This can prevent sand from escaping from the joints. Sealing may be a good idea in general because pavers near a pool see more damaging weathering effects than other pavers from the combination of water, chlorine, sun, etc. Installing swimming pool pavers can be tricky business. Coordinating the height of the pavers with the height of the pool, as well as installing coping correctly, without damaging the poolside, can be challenging for those without experience. A beginner paver installer should not attempt this without consulting a professional. In fact, it may pay to hire a contractor in this case. Working around a pool presents particular difficulties that other projects do not – for instance, workers need to take care not to knock material or brick into the pool! Selecting particular colors of paver should depend on a number of factors. Lighter pavers do not get very hot on a sunny day, but they do reflect a lot of light, which can be bothersome. Darker pavers don’t have this problem, but can get hot on a sunny day. You will thus probably want to pick a color somewhere in the middle of these two extremes. Whatever color you select, make sure it complements your pool, patio, and backyard. If you are installing pavers near a body of salt water, take care in selecting a paving stone that will stand up to salt. Many are not able to, and will degrade and break down after constant exposure to salt water. Your contractor or paver manufacturer should be able to give you recommendations as to the proper brick to select for this purpose. If you are not building your pool deck near a body of salt water, you should make sure that your pavers can withstand constant exposure to chlorinated water. Concrete pavers often fit these requirements, but check with your contractor or manufacturer. Also remember that you will be adding pool coping pavers around the border of your paver deck and pool. These aren’t pavers per se, but they do come in the same color and style as the pavers you install around the pool itself. These coping materials will cap and cover the boundary between the deck and the pool, providing you with both the beauty of the sleek design as well as the safety needed to protect those entering and exiting the pool. When it comes time to install your new pool deck, don’t discount the other designs and projects you can combine into this work. For instance, this may be the perfect time to explore doing some extra pool landscaping in conjunction with your paver project. Indeed, landscaping pavers that are of the same kind and type as your pool pavers can be used to ensure that you maintain the harmony among all the projects in your yard. Consider as well that you can add to or expand your patio, perhaps connecting the patio pavers to the pool deck to make a nice place for you and your friends/family to hang out. you could also add walkway pavers around your pool deck to connect areas of your yard, or even to integrate the whole structure into your front yard walkways and driveway. Again, all the same materials can be used for these structures, and it will be cheaper per square foot to get all of this done at the same time than if you just did all of this in separate projects over many seasons. There are many pool ideas out there if you keep your eyes open; use some of those listed here while also checking out examples in magazines, friends’ homes, and so on. Of course, installing pool pavers isn’t cheap, mostly because the material and installation is so time and labor intensive. This is made even more significant due to the fact that the pavers must be installed near the pool, making the job that much more difficult and sensitive. Thus, you should know that this project won’t be cheap; however, it will most definitely be worth it in the long run. Usual prices run around $10-$15 per square foot, though other costs may also accrue if your project needs special grading, excavation, etc. Indeed, though the pool pavers cost may be relatively high in the short term, you will benefit from an increased property value for your home and pool as well as a beautiful place for you to hang out in your own yard. This can save you money indirectly, as you can stay around the house more to relax – no need to go driving to public pools or beaches or taking expensive and long trips just to get a little R&R! Regardless of these benefits, you’ll still want to save some money where you can when it comes to installing pavers. I wouldn’t try to take shortcuts when it comes to the installation of the pavers – you want to make sure the job is done right, especially near your pool where one mistake could have catastrophic consequences. (Believe me, I’ve seen some terrible things happen to pools where hardscape and landscape work is done incorrectly!) However, you can try to save money by finding pavers for sale. This can be done in many ways, and I’ve covered this on this site in places like this article. Of course, the same warning above applies – don’t get discount pavers without making sure that they are top quality and integrity, both in their looks and strength – not all pavers are created equal! This entry was posted in Project Ideas and tagged pool coping pavers, pool deck pavers, pool paver, pool pavers, swimming pool pavers by Will Grander. Bookmark the permalink. I have a pool contractor suggesting that the pavers have been placed to close to the coping invariably causing the potential of loosening the coping. Does this have any merit?